One afternoon in my Feldenkrais program, trainer Katrin Smithback invited us to take a break from a seated activity by having us stand. For a split second my brain interpreted her statement to mean touching my toes with legs straight, a cognitive fossil from elementary school gym classes. But I caught onto that implied meaning and realized I had the freedom to fulfill her request however I wanted. I bent my knees, lowered my arms and placed one hand on each foot. Other people stood on one leg, raised the other foot towards their hands, and touched their toes that way. There are likely many ways, other than the conventional method, to touch the toes: returning to a cross-legged position on the floor and grabbing the toes; lying on one’s side, curling the knees towards the chest and reaching to touch the toes. 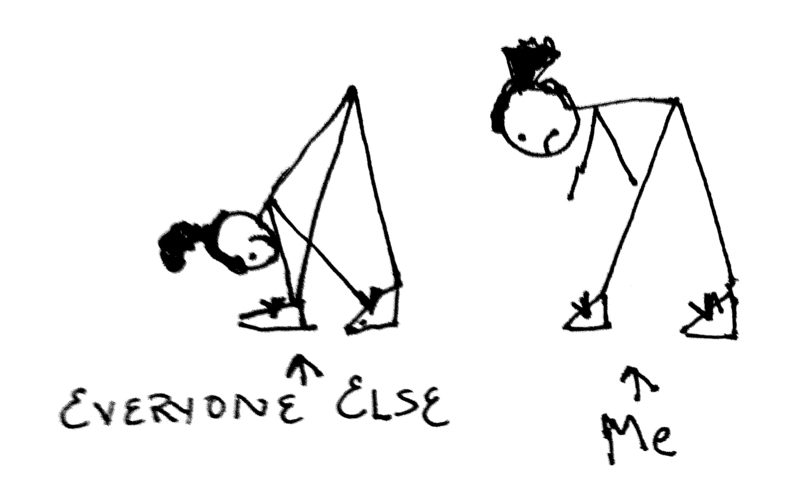 Highly elastic folks could do a backbend and reach for their toes with their fingertips. In Feldenkrais, there is no “right” way to do anything, as no two bodies are alike, and our own bodies change over time. Yet, society, through umpteen reinforcements in different contexts, conditions us to believe that “touching the toes” must be done with straight legs (from a standing or seated position), or else it’s cheating. As a result, there are people who might feel badly about themselves or their range of movement if they can’t do that particular thing. “I can’t touch my toes” might become a limiting belief or part of a person’s self-image, making them feel less comfortable in environments such as fitness classes where toe-touching via the straight leg method is touted, if not enforced by tyrannical toe touchers. Even if one might never be able to plant their fingertips or palms on the floor with legs straight, incrementally becoming more limber might still be of benefit. In which case, “Reach towards your toes” is more helpful than “touch your toes”. Toe touching is one tiny example of myriad ways in which a norm or standard is created against which people are measured or are taught to compare themselves. We often take norms for granted and assume everyone has the same understanding until someone either challenges or deviates from the status quo. I see the power of norms among some people who write but hesitate to call themselves “writers” because they haven’t published a book, even though they write regularly. Somewhere along the way they learned that “writer” means bound pages to hold in their hand, even if the act of writing, whether for private or public consumption, has helped them and others. Ditto for making art. There are many for whom creative expression enriches their lives, but they are reluctant to call themselves an “artist” if their work hasn’t led to a steady income, a solo gallery show or meets another standard. Since that passage was published in 1972, human nature likely hasn’t changed all that much, even if the “round holes” of today are not identical to those prevailing 40 some years ago. Still, technological developments have created opportunities for more and more people to participate in the world as writers (from blogging to publishing) and artists, whether for pure pleasure or also for profit. I know of at least one excellent, classically trained oil painter who successfully sells his work on eBay, a venue many other artists won’t go near because it doesn’t meet their or the art world’s standards. As the marketplace, social networking and technology continue to evolve, making what was once impossible possible in a variety of endeavors, it might be a person’s notions about how things are “supposed to be done”, ideas that were planted by an elementary school gym teacher or other authority figures decades ago, that limit their freedom now. By trying to find our own way to do a movement in Feldenkrais, even if it feels awkward and looks strange, we challenge these inherited authorities and begin to access our own. Feldenkrais trainers and teachers emphasize that people who cannot do the movements easily often learn more about themselves than others whose bodies readily oblige. If you can’t touch your toes conventionally, consider yourself lucky. You might be one footstep ahead on the path to freedom. Someone once asked if I could stand on my hands. “Sure,” I said. I placed a hand under each of my shoes. Way easier than inverting my body.